We are currently re-developing our website and hope to re-launch at the end of August with our new portfolio of self catered ski accommodation in France and throughout Europe. We have partnered up with one of Europe’s biggest suppliers of high quality self catered property, and we will be offering this to all the White-Peak guests. As well as ski accommodation, we will also have a large range of self catered accommodation for summer holidays in France and beyond. You will be able to check the live price availability and book online. Watch this space….we think you’ll like it. After a mild and sunny March, I was just about ready to hang up my skis and get my bike out for the summer. 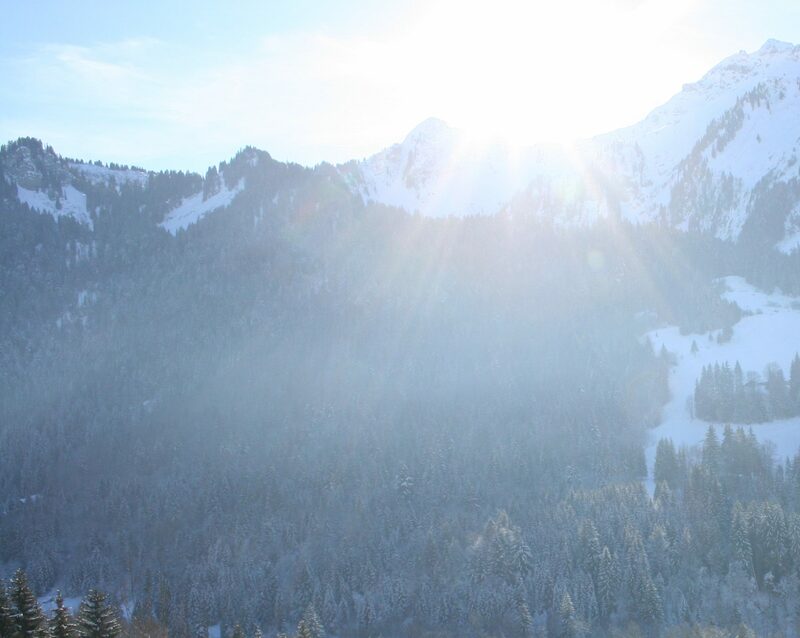 However, winter has returned with a vengeance – heavy snow on the mountain (even a light covering in the village of Chatel) and cold temperatures and more snow forecast for the rest of the weekend. With the lifts staying open until the 22nd April, and the pistes (and off piste) empty, the next 8 days promise to offer fantastic skiing and boarding in the area. The Chatel tourist board are still reporting over 1 m 50 at top station and there is still 2 m at the top of the Portes du Soleil. For those of us who live here – this is a little reward for all the hard work during the winter season. And once the lifts close, if it remains snowy I’ll just have to get my touring skis back out! We’re very excited about Basscamp Festival, a 5 day music festival being held in Morzine which starts on the 1st April. Find out all about Basscamp Festival and here is the festival running order. After 17 years on the racing circuit, the Swiss racer Didier Cuche retired from ski racing in Schladming, Austria this weekend. Cuche made his final run dressed in traditional mountain clothing, with a flat cap and a rucksack on his back, and on his traditional wooden skis and leather boots, finished off with the slowest run of his career. What a way to retire! There wasn’t a dry eye in the house (or on the mountain). Wow, what a season it has been so far. We had huge dumps of snow at the end of December and throughout January, followed by a couple of weeks of Siberian temperatures. The snow is fantastic, over 3 m at the top of the Portes du Soleil. And once again this area has benefited most from the snowfall. 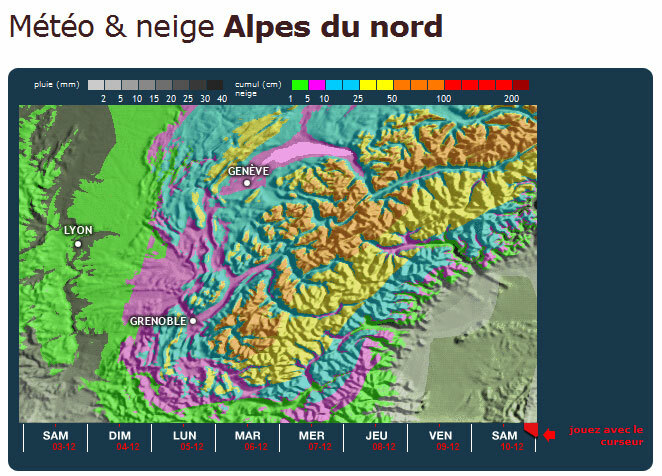 Pretty much all areas in France have good coverage (including areas not in the mountains) but as per usual the Portes du Soleil has more snow at 2-2500 m than Val Thorens has at 3200 m. Still goes to show – you don’t need to go high to get the best snow, you just need to come to the Portes du Soleil! The White-Peak team have been busy not only selling ski holidays in the Portes du Soleil, but also with music festivals in Avoriaz, and Alpine interior design projects. However, this all comes to an end at the weekend and we hope to be able to get some skiing done (just in time for the kids breaking up from school)! It is very snowy, there is lots of snow on and off piste and in the village, and it is snowing heavily! If you are interested in skiing, and you have an internet connection, I am sure it won’t have escaped your notice that it has been snowing in the Alps. Here in Chatel and the Portes du Soleil, it has been dumping it down for days. The freezing level is low and the snow depths are very impressive for this early in the season. The top of the Portes du Soleil has over 2 m, and even at the bottom of the runs we have nearly a metre. Snow conditions have settled since the weekend, and the avalanche danger has been reduced to 3 (which is still pretty high, but a lot better than the 4/5 we had at the end of last week). So the off piste is open for business as long as you keep your sensible head on. And it is still snowing, with up to 50 cm forecast for the next 24-36 hours. This snow gives us a fantastic base to build on for the rest of the season. 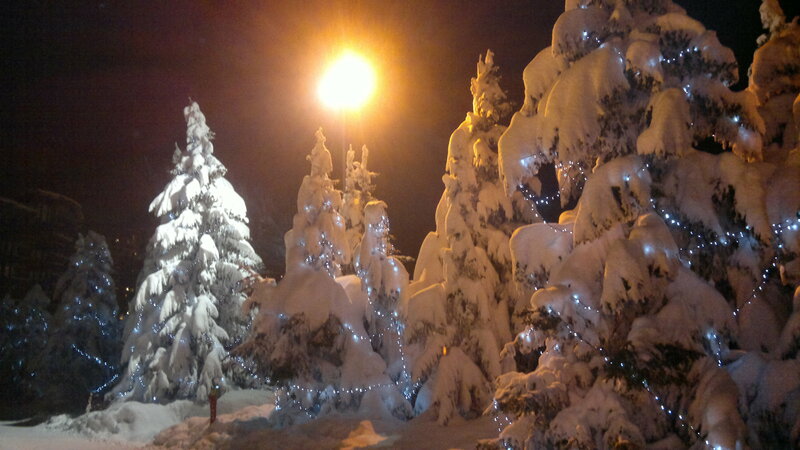 It also ensures great conditions for the Christmas and New Year guests. For now though, all the locals are just walking around with big smiles on their faces. With hardly anyone on the mountain, there is more than enough powder to go around. Finally we have woken up to white mountains and the high pressure which we have been enjoying all Autumn has finally dispersed. The forecast for the the next week is looking great – cold temperatures and snow! Take a look at this prediction for next weekend – over a metre of snow predicted to fall in 24 hours. Time to wax my skis and get my snow tyres on.